The Battle of Carrhae was fought in 53 BC between the Parthian Empire and the Roman Republic near the town of Carrhae. The Parthian Sepahbod ("General") Surena decisively defeated a superior Roman invasion force under the command of Marcus Licinius Crassus. It is commonly seen as one of the earliest and most important battles between the Roman and Parthian empires and one of the most crushing defeats in Roman history. After the Roman defeat at Carrhae, many wars between the two nations ensued for seven years. Crassus, a member of the First Triumvirate and the wealthiest man in Rome, had been enticed by the prospect of military glory and riches and decided to invade Parthia without the official consent of the Senate. Rejecting an offer from the Armenian King Artavasdes II to allow Crassus to invade Parthia via Armenia, Crassus marched his army directly through the deserts of Mesopotamia. His army clashed with Surena's force near Carrhae, a small town in modern-day Turkey. Despite being heavily outnumbered, Surena's cavalry completely outmaneuvered the Roman heavy infantry, killing or capturing most of the Roman soldiers. Crassus himself was killed when truce negotiations turned violent. His death led to the end of the First Triumvirate and the resulting civil wars between Julius Caesar and Pompey. The war in Parthia resulted from political arrangements intended to be mutually beneficial for Crassus, Pompeius Magnus, and Julius Caesar — the so-called First Triumvirate. In March and April 56 BC, meetings were held at Ravenna and Luca, in Caesar's province of Cisalpine Gaul, to reaffirm the weakening alliance formed four years earlier. It was agreed that the triumvirate would marshal their supporters and resources to secure legislation for prolonging Caesar's Gallic command and to influence the upcoming elections for 55 BC, with the objective of a second joint consulship for Crassus and Pompeius. The leaders of the triumvirate aimed to expand their faction's power through traditional means: military commands, placing political allies in office, and advancing legislation to promote their interests. Pressure in various forms was brought to bear on the elections: money, influence through patronage and friendship, and the force of a thousand troopers brought from Gaul by Crassus's son Publius. The faction secured the consulship and most, though not all, of the other offices sought. Legislation passed by the tribune Trebonius (the lex Trebonia) granted extended proconsulships of five years, matching that of Caesar in Gaul, to the two outgoing consuls. The Spanish provinces would go to Pompeius; Crassus arranged to have Syria, with the transparent intention of going to war with Parthia. The power struggle in Parthia between Orodes II and his brother Mithridates III may also have been seen an opportunity for invasion as Parthian army may have been considered as tired and battle-weary. The notoriously wealthy Marcus Crassus was around sixty and hearing-impaired when he embarked on the Parthian invasion. Greed is often regarded by the ancient sources, particularly his biographer Plutarch, as his major character fault and also his motive for going to war. Historian of Rome Erich Gruen believed that Crassus's purpose was to enrich the public treasury, since personal wealth was not what Crassus himself most lacked. Other modern historians tend to view envy and rivalry as his motivation, since Crassus’s long-faded military reputation had always been inferior to that of Pompeius, and after five years of war in Gaul, to that of Caesar. His major military achievement had been the defeat of Spartacus nearly 20 years earlier, and before that he had seen limited action, most notably the Battle of the Colline Gate. Plutarch notes that Caesar wrote to Crassus from Gaul, endorsing the plan to invade Parthia — an indication that he regarded Crassus's military campaign as complementary and not merely rival to his own. Another factor in Crassus's decision to invade Parthia was the expected ease of the campaign. The Roman legions had easily crushed the numerically superior armies of other eastern powers such as Pontus and Armenia, and Crassus expected Parthia to be an easy target. Cicero, however, suggests an additional factor: the ambitions of the talented Publius Crassus, who had commanded successful campaigns in Gaul under Caesar. Upon his return to Rome as a highly decorated officer, Publius took steps to establish his own political career. Roman sources view the Battle of Carrhae not only as a calamity for Rome and a disgrace for Marcus Crassus, but also as a tragedy for cutting short Publius Crassus's promising career. Some Romans objected to the war against Parthia. Cicero calls it a war nulla causa (“with no justification”), on the grounds that Parthia had a treaty with Rome. The tribune Ateius Capito put up strenuous opposition, and infamously conducted a public ritual of execration as Crassus prepared to depart. Despite protests and dire omens, Marcus Crassus left Rome on November 14, 55 BC. Publius Crassus joined him in Syria during the winter of 54–53 BC, bringing with him the thousand Celtic cavalry troopers from Gaul who remained loyal to their young leader until death. Crassus arrived in Syria in late 55 BC and immediately set about using his immense wealth to raise an army. He assembled a force of seven legions (about 35,000 heavy infantry). In addition he had about 4,000 light infantry, and 4,000 cavalry, including the 1,000 Gallic cavalry Publius had brought with him. With the aid of Hellenic settlements in Syria and support of about 6,000 cavalry from Artavasdes, the Armenian king, Crassus marched on Parthia. Artavasdes advised him to take a route through Armenia to avoid the desert and offered him reinforcements of 16,000 cavalry and 30,000 infantry. Crassus refused the offer and decided to take the direct route through Mesopotamia, and capture the great cities in the region. In response, the Parthian king Orodes II divided his army and he took most of the soldiers, mainly foot archers with a small amount of cavalry, to punish the Armenians and sent the rest of his forces, 9,000 horse archers and 1,000 cataphracts under the command of the general Surena, to scout out and harass Crassus' army. Orodes did not anticipate that Surena's force, outnumbered by almost four to one, would be able to defeat Crassus, and merely wanted to delay him. Crassus received directions from the Osroene chieftain Ariamnes, who had previously assisted Pompey in his eastern campaigns. Crassus trusted Ariamnes, but Ariamnes was in the pay of the Parthians. He urged Crassus to attack at once, falsely stating that the Parthians were weak and disorganized. He then led Crassus's army into the most desolate part of the desert, far from any water. Crassus then received a message from Artavasdes, claiming that the main Parthian army was in Armenia and begging him for help. Orodes himself was engaged in the battle in Armenia and he had appointed General Surena to confront the Roman army. Crassus ignored the message and continued his advance into Mesopotamia. He encountered Surena's army near the town of Carrhae. Before the battle, Orodes II sent an ambassador asking the Romans why they had broken terms of the peace treaty. Crassus proudly told the ambassador that he’ll give the answer to Orodes personally in Seleucia, the Parthian capital, to which the ambassador showed the palm of his hand and replied, “If you see any hair here, you’ll see Iranian soil”. After being informed of the presence of the Parthian army, Crassus panicked. His general Cassius recommended that the army be deployed in the traditional Roman fashion, with infantry forming the center and cavalry on the wings. At first Crassus agreed, but he soon changed his mind and redeployed his men into a hollow square, each side formed by twelve cohorts. This formation would protect his forces from being outflanked, but at the cost of mobility. The Roman forces advanced and came to a stream. Crassus' generals advised him to make camp, and attack the next morning in order to give his men a chance to rest. Publius, however, was eager to fight and managed to convince Crassus to confront the Parthians immediately. 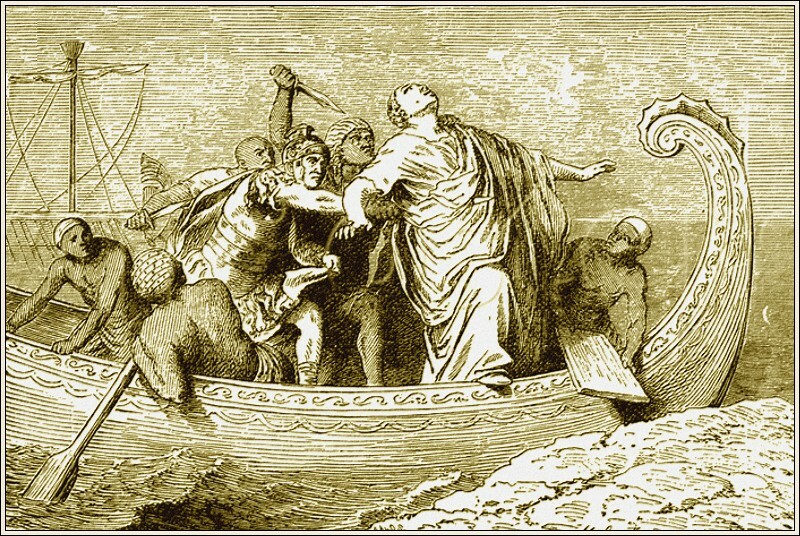 Crassus had destructed all bridges after passing them for two reasons: First, he wanted to make sure his army won’t think of deserting the battlefield and flee back. The second reason was that, the Parthian cavalry, known as “shadows of the desert” could strike surprise attacks from any direction, inflict damage and escape; thus Crassus wanted to prevent any attack from behind. The Parthians went to great lengths to intimidate the Romans. First they beat a great number of hollow drums and the Roman troops were unsettled by the loud and cacophonous noise. Surena then ordered his cataphracts to cover their armor in cloths and advance. When they were within sight of the Romans, they simultaneously dropped the cloths, revealing their shining armor. The sight was designed to intimidate the Romans, but Surena was impressed by the lack of effect it had. Though he had originally planned to shatter the Roman lines with a charge by his cataphracts, he judged that this would not be enough to break them at this point. Thus, he sent his horse archers to surround the Roman square. Crassus sent his skirmishers to drive the horse archers off, but they were driven back by the latter's arrows. The horse archers then engaged the legionaries. The legionaries were protected by their large shields (scuta) and armor (reenactment with composite bows do not answer the question whether arrows can penetrate mail), but these could not cover the entire body. Some historians describe the arrows partially penetrating the Roman shields, and nailing the shields to the limbs of the Roman infantry. Other historians state that the majority of wounds inflicted were nonfatal hits to exposed limbs. The Romans repeatedly advanced towards the Parthians to attempt to engage in close-quarters fighting, but the horse archers were always able to retreat safely, loosing Parthian shots as they withdrew. The legionaries then formed the testudo formation, in which they locked their shields together to present a nearly impenetrable front to missiles. However, this formation severely restricted their ability in melee combat. The Parthian cataphracts exploited this weakness and repeatedly charged the Roman line, causing panic and inflicting heavy casualties. When the Romans tried to loosen up their formation in order to repel the cataphracts, the latter rapidly retreated and the horse archers resumed shooting at the now more exposed legionnaires. Crassus now hoped that his legionaries could hold out until the Parthians ran out of arrows. However, Surena used thousands of camels to resupply his horse archers. Upon realizing this, Crassus dispatched his son Publius with 1,300 Gallic cavalry, 500 archers and eight cohorts of legionnaires to drive off the horse archers. The horse archers feigned retreat, drawing off Publius' force who suffered heavy casualties from arrow fire. Once Publius and his men were sufficiently separated from the rest of the army, the Parthian cataphracts confronted them while the horse archers cut off their retreat. In the ensuing combat the Gauls fought bravely, however their inferiority in weapons and armor was evident and they eventually retreated to a hill, where Publius committed suicide while the rest of his men were slaughtered. Crassus, unaware of his son's fate but realizing Publius was in danger, ordered a general advance. He was confronted with the sight of his son's head on a spear. The Parthian horse archers began to surround the Roman infantry, shooting at them from all directions, while the cataphracts mounted a series of charges that disorganized the Romans. The Parthian onslaught did not cease until nightfall. Crassus, deeply shaken by his son's death, ordered a retreat to the nearby town of Carrhae, leaving behind thousands of wounded, who were captured by the Parthians. The next day, Surena sent a message to the Romans, offering to negotiate with Crassus. Surena proposed a truce, allowing the Roman army to return to Syria safely in exchange for Rome giving up all territory east of the Euphrates. Surena either sent an embassy to the Romans by the hills or went himself stating he wanted a peace conference to evacuate. Crassus was reluctant to meet with the Parthians, but his troops threatened to mutiny if he did not. At the meeting, a Parthian pulled at Crassus' reins, sparking violence. Crassus and his generals were killed. After his death, the Parthians allegedly poured molten gold down his throat, in a symbolic gesture mocking Crassus' renowned greed. There are other accounts of Crassus’ death: One of them suggests that he was killed by Surena on the battlefield. Another version states that he was killed by his own generals after being defeated. The remaining Romans at Carrhae attempted to flee, but most were captured or killed. Roman casualties amounted to about 20,000 killed and 10,000 captured making the battle one of the costliest defeats in Roman history. Parthian casualties were minimal. Rome was humiliated by this defeat, and this was made even worse by the fact that the Parthians had captured several Legionary Eagles. It is also mentioned by Plutarch that the Parthians found the Roman prisoner of war that resembled Crassus the most, dressed him as a woman and paraded him through Parthia for all to see. This, however, could easily be Roman propaganda. Orodes II, with the rest of the Parthian Army, defeated the Armenians and captured their country. However, Surena's victory invoked the jealousy of the Parthian king, and he ordered Surena's execution. Following Surena's death, Orodes II himself took command of the Parthian army and led an unsuccessful military campaign into Syria. The Battle of Carrhae was one of the first major battles between the Romans and Parthians. This battle also created the myth that Rome's legions could not combat the Parthian army. This myth was not dispelled even when the Parthian capital was sacked several times and the several defeats that Roman armies inflicted to the Parthian ones. It was this belief that led Parthia to invade Syria and Armenia several times, with varying successes. Gaius Cassius Longinus, a questor under Crassus, led approximately 10,000 surviving soldiers from the battlefield back to Syria, where he governed as a pro-questor for two years, defending Syria from Orodes II's further attacks. He received praise from Cicero for his victory. Cassius later played a key role in the conspiracy to assassinate Julius Caesar in 44 BC. One of the more dangerous sides to this campaign is that people began to recognize Parthia as a very powerful state subsisting side by Rome. They were in a sense, equals. This was deemed intolerable by the Romans who believed they had no equals, especially those on the eastern border. They also realized that the Roman soldiers could not effectively fight against Parthian cavalry. The capture of the golden aquilae (legionary battle standards) by the Parthians was considered a grave moral defeat and evil omen for the Romans. At the time of his assassination, Caesar was planning a retaliatory war. The Parthians are said to have feared especially harsh retribution if Caesar won, because the surviving son of Crassus would be among the Roman forces. However, a more immediate effect of the battle may have been the fall of the Roman Republic, and thus the beginning of imperial monarchy at Rome. Sulla's first march on Rome in 88 BC had begun the collapse of the republican form of government, but the death of Crassus and the loss of his legions utterly destabilized the balance of power at Rome. Along with the death of Julia, Pompey's wife and Caesar's daughter, Crassus' death may have severed the ties between Caesar and Pompey; the first Triumvirate no longer existed. As a result, civil war broke out, Caesar won, and the Republic quickly became an autocratic dictatorship. During the Roman Republican civil wars the Parthians sided first with Pompey and then with Brutus and Cassius, but took no action until 40 BC, when Pacorus, assisted by the Roman deserter Quintus Labienus conquered a great part of Syria and Asia Minor. In Judea, the Parthian commander Barzapharnes deposed king Hyrcanus II and appointed the latter's nephew Antigonus as king in his place. During this period, the Parthians restored their territory to nearly the limits of the old Achaemenid Empire and controlled all of Asia Minor except for a few cities but the Parthian successes were not long-lasting. In 39 BC, a Roman counterattack under Ventidius in Asia Minor defeated Labienus, who was subsequently captured and executed. Orodes' son Pacorus was himself later killed by Ventidius in 38 BC. Orodes, who was deeply afflicted by the death of his gallant son, appointed his son Phraates IV successor, but was soon afterwards killed by him. Plutarch relates that Orodes understood Greek very well. After the death of Crassus the Bacchae of Euripides was presented at Artavasdes' court, with the head of Crassus himself allegedly being used as an accessory for a scene actually including a severed head, on the order of the king.